The circuit given here has three sections namely oscillator, switching stage and a step up stage. The oscillator is build around a NE555 timer operating at 25 KHz. The output of the NE555 coupled to the base of the power transistor TIP3055 which is the switching device. The power transistor drives primary of the step up transformer at 25 KHz and as a result a high voltage will be induced across its secondary. A 12V lead acid battery can be used for powering the circuit. TIP3055 must be mounted on a heat sink. T1 can be an EHT (extra high tension) transformer used in television sets. For an EHT from 20inch TV, the output voltage will be 8 to 10 KV @12V supply voltage.This circuit is not an efficient one and is not suitable for any serious applications. this circuit is a very dangerous one. The output voltage of this circuit is in Kilo volts and it can seriously injure you or kill you. 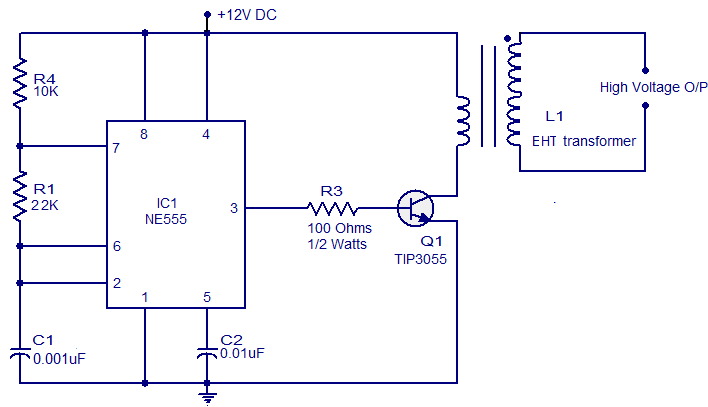 Try this circuit only if you have enough experience dealing with high voltages. 0 Response to "Step Up Circuit Low Voltage To High Voltage"